Horace was a gold and cameo watch-case maker. He lived at 24 Clerkenwell Close when he entered his marks as a case maker on 17 February 1816 and as a cameo puncher on 14 May 1818. His marks were "HG," in intaglio without a surrounding punch for goldwork. Cameos had his initials divided by a pellet and the same surrounded by a rectangle with cut corners. He moved to 23 Coppice Row by 19 March 1819 and entered his marks again on 15 May 1822. Horace and his first wife Sophia had four children. Nothing is known of her death, but it was by the time he married Anna Stoddart in 1831. Horace and Ann were married at St. John's Church in Clerkenwell, which sustained major damage during the German blitz. Poor health conditions in London and a lawsuit brought by relatives may have motivated the family to move to the United States shortly after Horace married Ann. Jane Bradford Gooch has relayed an oral tradition that his uncle Albert Gooch gave Horace significant amounts of money as a gift. Albert's family thought of it as a loan, and wanted it back after he died. This apparently came about in 1831. Court records haven't been searched for an impending case. Clarissa (Stoddart) Gooch's diary gives their arrival date in New York City. This points to their ship being Hannibal, mastered by Capt. Frederick Hebard. Clarissa said that Horace got on the ship in Portsmouth, not London. 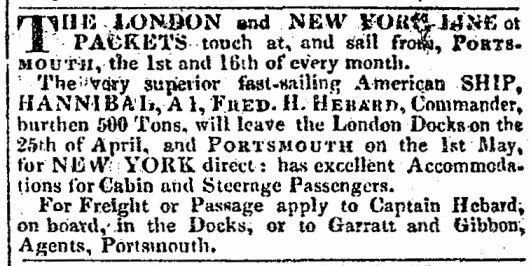 It was routine for packet (mail) ships to stop in Portsmouth on their regular trips from London to New York. After Horace got on the ship in Portsmouth she reports mostly calm sailing. They arrived in New York City on 4 June. 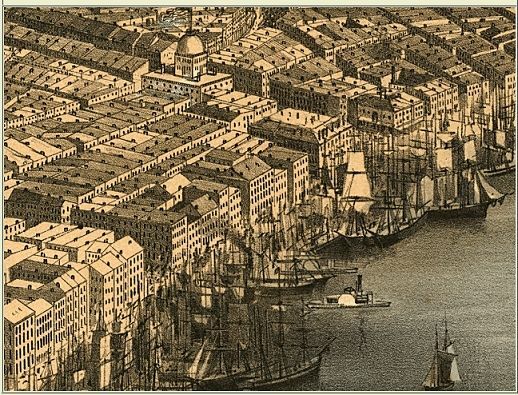 Hannibal was part of the London Line run by John Griswold, and his ships anchored at a pier at the foot of Pine Street. The Gooch children would come on the same ship later that year. The advertisement below is from a Portsmouth paper for the trip Hannibal made with Horace, Ann and Clarissa. The area of waterfront on the East River in New York City that included the London Line pier. This image was drawn in 1856 but wouldn't have looked much different when the Gooches arrived. On 12 October 1831 the children sailed into New York with what must have been a conspicuous display of their household goods, including several pianos and a harp. The captain's daughter was listed just before them, and she may have Horace had decided they should settle in Cincinnati, and he and Ann had gone out there to buy property. They left New York in late December or early January. Apparently they would have waited until Spring, but Ann was pregnant and Horace was eager to get to Ohio. Clarissa kept a diary of the trip. They sailed up the Hudson River to Albany, then hired sleighs to take them across the state. They went down to Olean Point and hired a flat barge with a small cabin to take them down the Allegheny and Ohio Rivers. They had to endure the worst of the New York snow belt weather, problems with sleigh drivers and surely plenty of bad advice. They piloted the barge themselves, which lead to numerous mishaps and ultimately its sinking. Ann had her baby before they got to Ohio. They made it to Cincinatti with only some water damage. The family settled on a rural spot on the outskirts of the town, actually in the very south of the village of Avondale, where Horace had a very comfortable brick house built. He named it "Beech Grove." A history of the Cincinnati suburbs from 1870 describes it as "a roomy edifice, well known to those familiar with the early history of the Lebanon Pike, as the place improved by Horace Gooch, about the year 1835, then called Beech Grove Female Seminary." This is a reference to the school that Horace's wife Ann ran. Horace was undoubtedly involved, but no specifics have been found. Family tradition has it that he could not afford his new house (Clarissa reports that Horace was impulsive and romantic, and this may be more evidence of it) and the Gooch's moved to Walnut Street (west side between 4th and 5th) in downtown Cincinnati by 1840. The Gooches continued the school there. The Cincinnati directory of that year refers to it as Anna's. They had moved the school to Elm Street (east side between 4th and 5th) by 1846, when the directory refers to it as Horace's. Horace died of cancer of the stomach in Cheviot, near Cincinnati, and was buried in the Episcopal Cemetery in downtown Cincinnati. He was reinterred in the Gooch plot at Spring Grove Cemetery on 25 July 1860. Ann had purchased the plot and was buried there 5 days later. Horace Gooch's will was rerecorded for the Hamilton County Court of Common Pleas after the loss of the original record in a courthouse fire on 29 March 1884. The transcriptions had been destroyed but the original probate files had not. I, Horace Gooch of Green Township, Hamilton County and the State of Ohio, being of sound and disposing mind and memory do make, publish and declare this to be my last will and testimony hereby revoking all former wills by me at any time made. First, I give and bequeath to my beloved wife Anna Amelia Gooch all my furniture, goods, chattels, monies and shares in and about my house [?] where of every kind or nature whatsoever for her whole and sole use and benefit and also my real estate in which [?] live and a lot in the grave yard on the Lebanon Road. Secondly whereas as my life is insured in the Ohio Life & Insurance Comp for five thousand dollars, which sum of five thousand dollars I give in trust to my executors hereinafter named for the purpose as follows. I desire the amount to be placed out at interest as they may think fit, taking proper good and ample security for the same, the interest whereof to be paid to my wife during her life and at her deceased the amount, namely five thousand dollars, to be divided share and share alike amongst my eight children (provided always) if my wife should die before my children should attain the age of twenty one, in that case the interest of the five thousand dollars to be applied to the maintenance and education of my four youngest children (namely) Horace, Anna, Charles and Fanny or such as may be living at her deceased when the youngest shall have attained the age of twenty one, then the five thousand dollars to be divided amongst my eight children or as many as may be living, but if any of my children should die leaving issue, his or her share to be divided amoungst such issue. Third, I hereby authorize any executors to advance any sum not exceeding one thousand dollars on my real estate should my wife desire it for the purpose of freeing the same and pay my debts. Fourthly, I hereby appoint my wife Anna Amelia Gooch, Thomas Kelsall and Henry Gooch my executors, in the event of their death or refusing to act either of them the remainder to elect new ones. In witness whereof I have this day set my hand and seal this Eighth day of December One Thousand Eight Hundred and Forty Seven. The witnesses were Noble S. Johnson, Benjamin Bemis?, Jr., and John Ade. The will was presented and accepted at court on 21 January 1848.
vital records sources: Horace's birth, marriage and death dates are in a family Bible owned in 2010 by Patrick Verdier. His baptism on 14 February 1792 is in the records of St. James Church, Clerkenwell, London. His first marriage is in the records of St. Anne's Blackfriars Church, London. His second marriage is in the records of St. John the Baptist (also known as St. John of Jerusalem) Chapel, Clerkenwell, London. His marriages were also reported in The Times of London, the second in the 25 March 1831 issue. His death is noted in The Cincinnati Daily Chronicle, issue of 12 January 1848, p. 1. His probate papers are recorded in will book 14, p. 582, (probate court) and his probate file is case #C A2814 (Box #3?). Henry Gooch's papers are in Box 19, case #C 10342, 5/23/1866.